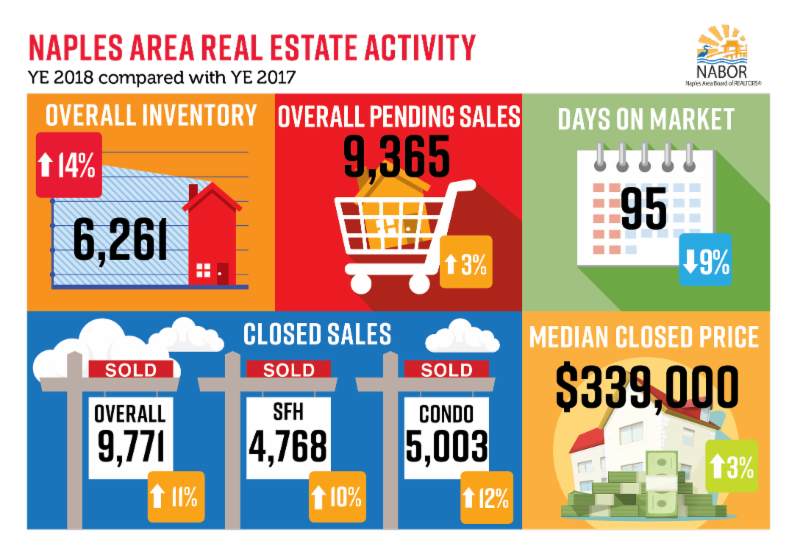 Naples, Fla. (April 18, 2019) – According to the March 2019 Market Report released by the Naples Area Board of REALTORS® (NABOR®), which tracks home listings and sales within Collier County (excluding Marco Island), the median closed price of homes decreased 5.6 percent to $340,000 in March 2019 from $360,000 in March 2018. Broker analysts reviewing the report clarified that the median closed price decrease was due, in part, to an increase in the number of closed sales of homes priced under $500,000 during the last year. Another reason for the decrease in median home price is due to sellers pricing their homes appropriately – based on actual comparisons of recently sold homes – to gauge their home’s estimated value rather than pricing their homes based on unvalidated values. The March 2019 Market Report showed overall closed sales decreased 1.7 percent to 973 in March 2019 compared to 990 in March 2018. This decrease was isolated to the single-family home market, whose sales in March 2019 fell by just 17 total sales compared to March 2018. The condominium market in March ended with 499 closed sales, the same number reported in March 2018. However, as Bill Coffey, Broker Manager of Amerivest Realty Naples pointed out, the report also showed closed sales in March increased 64 percent compared to February 2019, which reported 595 closed sales; and it increased 65 percent compared to January 2019, which reported 588 closed sales. Many brokers have reported an increase in contracts (pending sales) during March, which they feel contributed to the 10 percent decrease in overall inventory for March. It is important to remember that inventory during the first quarter of 2018 included many homes that were put back on the market after having been taken off the market for repairs following Hurricane Irma during the last quarter of 2017. As such, the report showed 8.7 months of inventory for March 2019, down 11 percent compared to March 2018. Geographically, the median closed price for condominiums in the Naples Beach area (34102, 34103, 34108) increased 13 percent to $805,0000 in March 2019 compared to $711,500 in March 2018, the highest increase of all areas reported. 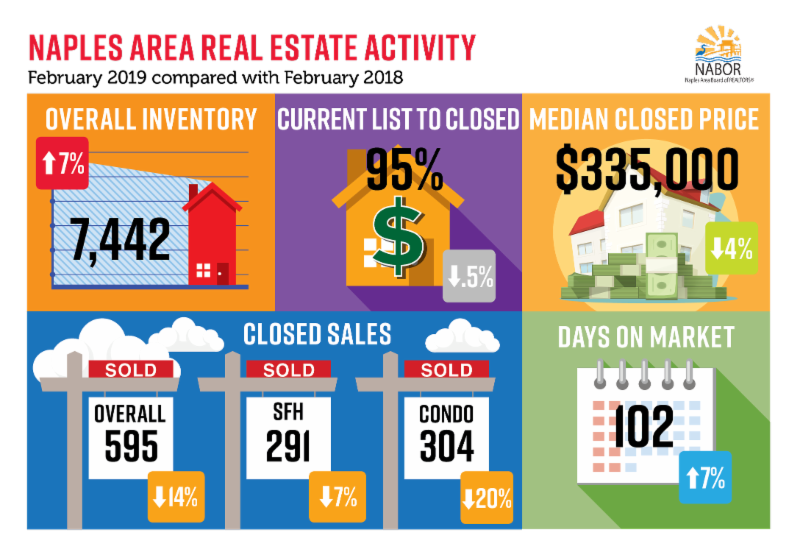 The median closed price for single-family homes increased the most in South Naples (34112, 34113) by 2.6 percent to $410,000 in March 2019 compared to $400,000 in March 2018. Inventory during March increased in only one segment and place: single-family homes in the Naples Beach area. This area’s inventory increased by 4.1 percent and is where a large majority of “spec” home building is taking place. Brokers reviewing the March report also discussed their concern about how water quality issues and short-term rental limits might impact the Naples housing market moving forward. Adam Vellano, West Coast Sales Manager, BEX Realty – Florida, and a member of the NABOR® Water Quality Task Force, remarked that actions by the new Governor to fast-track many delayed water-quality projects, appoint a new South Florida Water Management Board, and request the Army Corps of Engineers modify Lake Okeechobee’s scheduled releases so there are fewer in the summer, is already being met with positive response. “If the county puts limits on rentals we may see a spike in inventory,” said Mike Hughes, Vice President and General Manager for Downing-Frye Realty, Inc., who added that a limit would be bad news for a good portion of our seasonal residents and the homeowners and investors who benefit from a healthy rental market. Huskey responded that “a move to restrict rental lengths to the term suggested could significantly impact sales in some areas of unincorporated Collier County.” As it stands, his company already has an 85 percent rental reservation rate for next season which shows confidence in the market. If you are looking to buy or sell a home in Naples, contact The Wakelin Team as we have the experience and knowledge to provide an accurate market comparison or negotiate a sale. We REALTOR® can ensure your next purchase or sale in the Naples area is a success. Naples, Fla. (March 8, 2019) – The year is off to a good start for homebuyers. Beyond escaping frigid temperatures up north, visitors looking to purchase a home in the Naples area during January were pleasantly surprised with their options as inventory levels increased 7 percent to 8,154 homes for sale in January 2019 from 7,605 homes for sale in January 2018. The good news didn’t stop there for new homebuyers in January as median home prices increased by only 1 percent to $325,000 in January 2019 from $322,500 in January 2018, according to the January 2019 Market Report released by the Naples Area Board of REALTORS® (NABOR®), which tracks home listings and sales within Collier County (excluding Marco Island). A new statistical reporting system with enhanced formats and data capture features was adopted by NABOR®. The January 2019 Market Report was prepared using the new system. Broker analysts reviewing the new report were quick to point out that a rare occurrence in January 2018 contributed to a reduction in overall closed sales reported in January 2019. Namely, that a developer added 79 newly constructed high-end condominium closed sales to the MLS during the month of January 2018. To further clarify, the actual “sales” were made over a three-year period, but the sales data for all 79 units was input into the MLS over a three-week period in January 2018. Consequently, this data is reflected in the monthly statistics as a 160 percent decrease in overall closed sales for homes in the $1 million to $2 million price category. It is for this reason that the January 2019 Market Report has been clarified to also reflect the removal of these anomalous sales in order to show a truer comparative analysis of the data. Many broker analysts reviewing the January 2019 Market Report felt the stock market tumble in late December may have contributed to potential homebuyers delaying purchasing decisions in January. This may be why there was a 6 percent decrease in overall closed sales reported for January 2019 compared to overall closed sales in January 2018. However, high-end homes increased 21 percent in the single-family home market and 18 percent in the condominium market in January 2019 compared to January 2018­. “Fee heavy condominiums are hurting,” said Adam Vellano, West Coast Sales Manager, BEX Realty – Florida. Even though inventory rose 6 percent in the under $300,000 condominium market in January, closed sales for this product in January dropped 25 percent. Geographically, inventory increased the most in Eastern Collier (10 percent) and Ave Maria (18 percent). 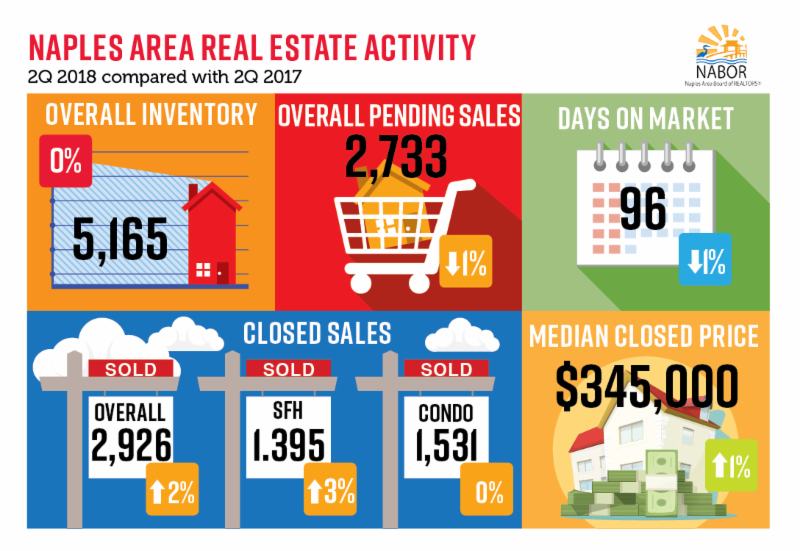 Naples, Fla. (December 21, 2018) – Home sales in November increased by double digits across every price category resulting in an overall increase of 24 percent compared to November 2017. 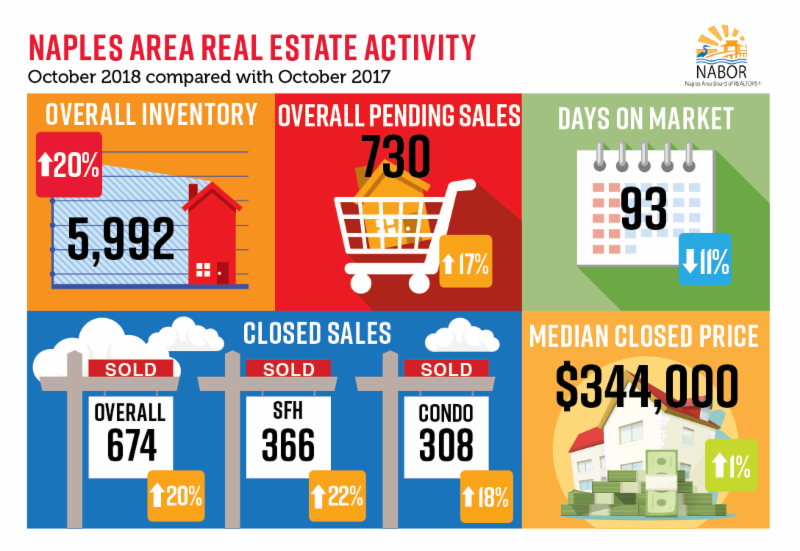 Median closed prices decreased for homes under $1 million in November and inventory rose 12 percent to 5,971 homes, according to the November 2018 Market Report released by the Naples Area Board of REALTORS® (NABOR®), which tracks home listings and sales within Collier County (excluding Marco Island). “New home construction in the lower price tiers is rushing to meet the needs of buyers and it’s building our inventory in much needed areas within eastern Collier,” said Mike Hughes, Vice President and General Manager for Downing-Frye Realty, Inc. The November market report supports Hughes’ claim as the East Naples area (34114, 34117, 34120 and 34137) saw the highest number of closed sales for single-family homes – 105 – with another 121 sales pending. Broken down geographically, Collier’s housing market in November had some interesting pockets of activity. For example, median closed prices decreased 19 percent in the Naples Beach area (34102, 34103, 34108); but increased 12 percent in the North Naples area (34109, 34110, 34119). There was a 90 percent increase in closed sales of condominiums in East Naples (34114, 34117, 34120, 34137), which brokers attribute to an increase in new construction of townhome developments east of Collier Boulevard. And single-family homes in Central Naples (34104, 34105, 34116) sold the fastest with an average 66 days on the market from listing to closing. If you are looking to sell a home in Naples, contact The Wakelin Team at BHHS as we have the experience and knowledge to provide an accurate market comparison so you can determine the right asking price. We can also ensure your next purchase in the Naples area is a success. 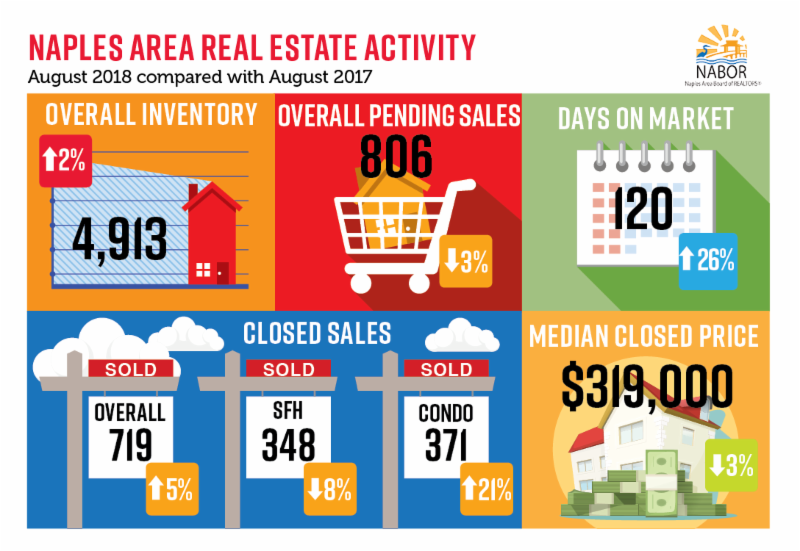 Naples, Fla. (August 24, 2018) – According to the National Association of REALTORS July market report, existing home sales in America decreased for the third straight month as a result of the severe housing shortage that is not releasing its grip on the nation’s housing market. Conversely, homes sales in the Naples area were up 8 percent in July according to the July 2018Market Report released by the Naples Area Board of REALTORS® (NABOR®), which tracks home listings and sales within Collier County (excluding Marco Island). The nation has only a 4.3-month supply of home inventory, while Naples has a healthier 6.25-month supply of inventory. 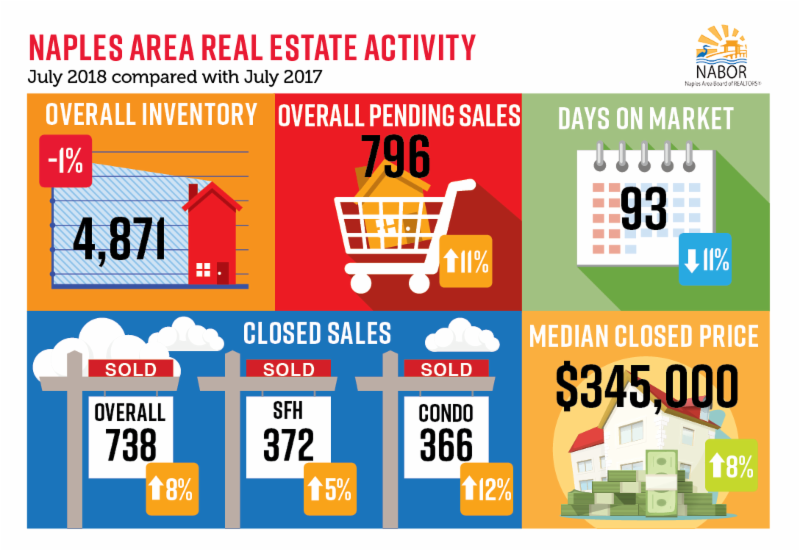 Interestingly, while July’s overall inventory fell 1 percent to 4,871 properties from 4,928 properties in July 2017, inventory increased 5 percent in the $300,000 and below price category. In fact, inventory for single-family homes in this price category jumped 21 percent in July to 345 from 286 in July 2017. If you are looking to sell a home in Naples, contact The Wakelin Team at Berkshire Hathaway HomeServices Florida Realty as we have the experience and knowledge to provide an accurate market comparison so you can determine the right asking price. We can also ensure your next purchase in the Naples area is a success.